If your a regular here on C&G (i love you) then you will know all about my resolutions that I keep banging on about. I am determined to keep on top of them and stick to what I have said. The number one goal on that list was skin. 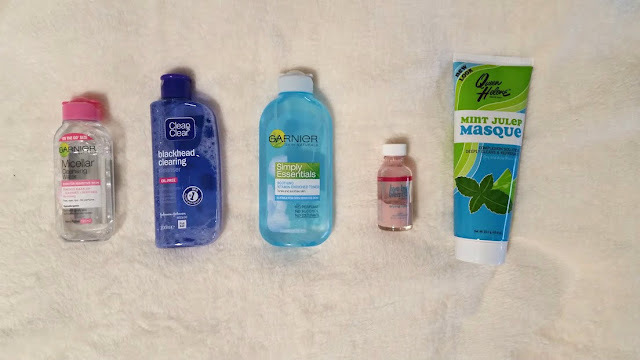 Improve and get into a real skincare routine. For a whole month now I've actually been doing it and now its time to share! Also, my skincare routine is only in the night. I only moisturise in the morning. This is the bit that I hate, the first stage of taking my makeup off. I get really lazy and end up reaching for a wipe. To stop myself, I just don't buy them anymore - banned. 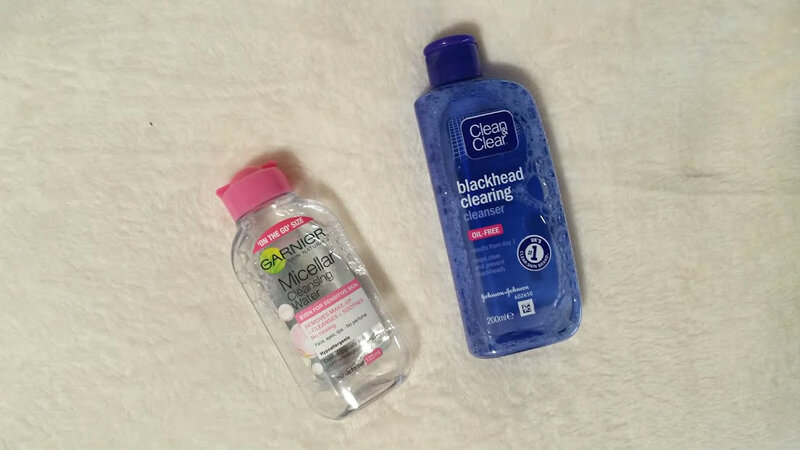 My first step is to remove and to do this I use the Garnier Micellar Water (£3.99) and with about 3 cotton pads all of my makeup is removed. Then I go in with a new addition to the skincare family, the Clean & Clear Cleanser (£4.20), it helps with taking any small traces of makeup off and gives it a good clean. After getting rid of all the makeup, I begin to calm and treat my skin. A toner is something that I have only just started to use and I haven't seen a difference as of yet, but my skin does feel cool after using it. 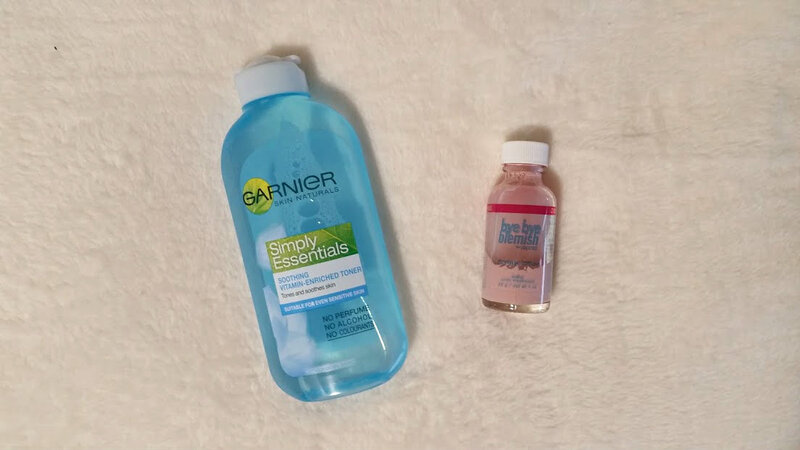 Another Garnier (£3.25) product that I love and is designed for sensitive skin there Soothing Toner, it smells like cucumbers and feels amazing. For spot treatment to banish those pesky blemishes have started to use something I got on amazon for £6 its called Bye Bye Blemish and is a alternative/cheaper dupe for the Mario Badescu Drying Lotion (£12.50). The price isn't that much of a difference but getting hold of it is. You take a cotton bud and place in into the bottle of bye bye and then apply as desired. It helps to dry out the spot that is forming or has formed. Big fan. 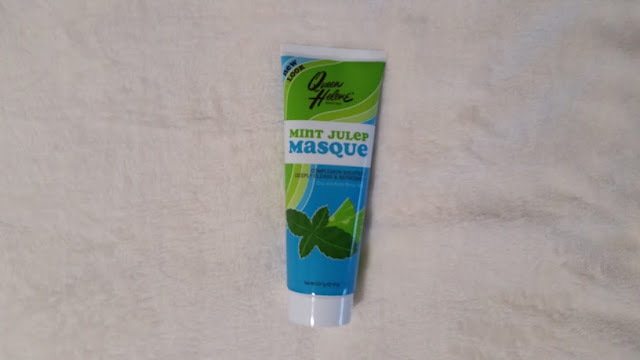 For when my skin needs a really good clean and is looking horrible, I have been using another Amazon find - the Queen Helen E Mint Julep Masque. Its a mask designed for oily and acne prone skin that instantly kills any bacteria. It feels all tingly on the skin and is great as a quick treatment. I do my best to use this once a week as it is very drying. As you can see there is no moisturisier pictured, I use good old E45. It nourishes and adds moisture to my skin in an instance. 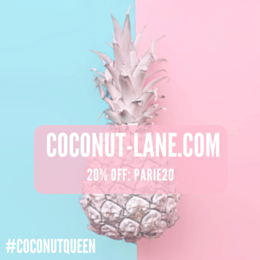 What are your favourite items of skincare?